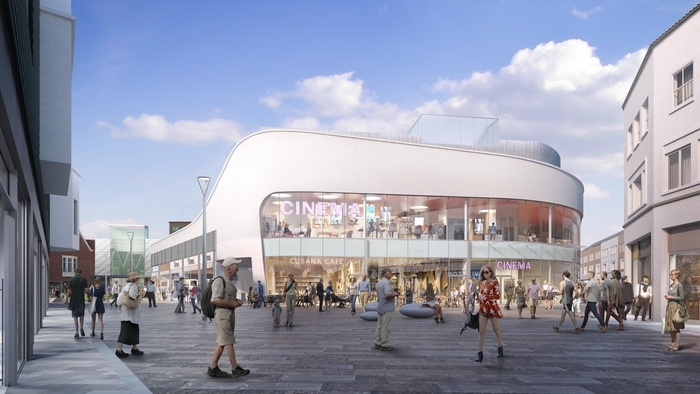 Planning permission has been granted by the Borough of Poole to convert existing space at the Dolphin shopping centre in Poole into a brand new, nine-screen cinema plus four adjacent casual dining restaurants. The cinema development is the latest improvement to the Dolphin, which is the largest covered retail destination in Dorset and has been owned by LGIM Real Assets (Legal & General) since 2013. It is part of a major improvement programme to the centre, announced in June 2017, following the restructuring of the existing headlease arrangements into a single, longer lease which resulting in the unlocking of £26 million of investment. Empire Cinemas has signed a 25-year lease to operate what will be the first multiplex in the town centre, with one of the nine screens being open-air on the rooftop, giving a memorable experience for holidaymakers and locals alike. The new cinema will be created by redeveloping the former Argos store and adjoining units at the end of the high street, generating more vibrancy and appeal for the town centre as a whole. The work will further enhance the Centre’s family-oriented offer. It will add an additional evening attraction as well as giving more reasons for residents and tourists to visit throughout the day. With an annual footfall of 11 million and covering some 530,000 sq ft, The Dolphin Centre is home to over 100 retail, restaurant and leisure brands from independent boutiques to top national names. It is anchored by Marks & Spencer, Primark and Beales department store, and is home to popular names such as River Island, Next, Boots, Trespass, Clarks and Pandora plus Poole Central Library, The Project climbing centre and Shine Dance Academy. Poole is an affluent, south coast town with above average household incomes. Over half the catchment is in Acorn’s Affluent Achievers and Comfortable Communities categories. The town is a major holiday destination, and tourist spend within the Dolphin centre is consistently high. Construction work will start this year. Joint leasing agents are Colliers International and Lunson Mitchenall. Architect for the improvement programme is TP Bennett.